It is May 1, and while most of my friends were probably still asleep, my people were packing several backpacks and bags in our car. Yeah, we are going on a trip! I love to go for trips, and I love to ride in the car. There is so much to look at outside the car windows. And as an added bonus: none of my people can dissappear out of a driving car. I definitely like to go on outings with my family way more, than having my family leave for work or school and only mom and I stay at home. Anyways, I hopped in the car, and of course sat down right on the driver's seat. I really hope that my humans one of these days get the broad hint, and let me apply for my own driver's licence. But, as everytime, I had to leave the strategically attractive spot and my people buckled me in the back seat. Well, I am fine with that look out spot, too. So Alina came in the car, buckled in next to me, and we were good to go. For a while I tried to learn for my future driver's licence and observed all the cars which were passing by, but then the early time took it's toll, and I fell asleep like Alina. Looking back I have to admit that this was just perfect, because after reaching our destination I didn't get a chance to sleep for a while! When my "dad" parked the car and I got out, I realiced right away that there was a special smell in the air - the smell of countless dogs. My "mom" said that they obviously not all smell good, but I thought the smell very interesting and informing. Especially, since for the last few weeks, I am very interested in a special smell: female dogs! So I checked real quick to see if one of the dogs (preferably the ladies), left an important message for me. "Mom", hurry up a bit - can't you see how excited I am?! Well, it seems she noticed, because she threatened me with carrying me on her arms like a little lapdog, if I would not slow down considerably. Yes, looking around confirmed that there were truly some lapdogs carried by their owners. And other dogs were pulled behind their humans in boxes of different sizes. Some were on the leash like me, more or less excited. 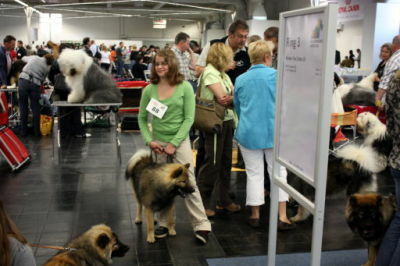 Oh, now I remembered: this must be the VDH European Winner dog show in Dortmund of which I heard my people speaking about. Okay, no problem. I will show a little self control here. I think my humans are right, and we will probably still reach our destination even when I stop showing my "sledge dog qualities", which are mixed with a shot of adolescence. I am a good boy, and I better start showing that I can behave. 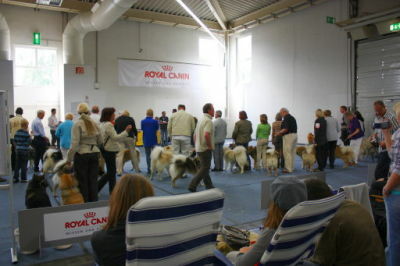 But the whole event is really exciting! So many dogs all over the place. 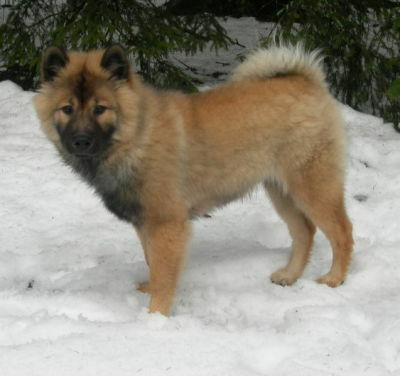 And then we reached our "destination": lots of Eurasier dogs and we went around, greeting the two- and four-leggers. And wow, I am soooooooo happy! My sister Bora is there, too!!! Those who know me, can imagine how happy I was! 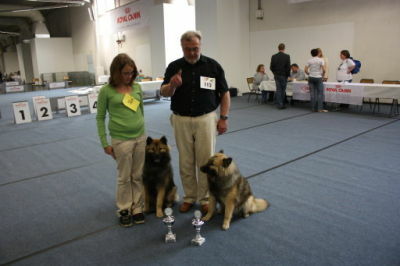 And, of course, there was not only Bora, but also my breeder, Herbert Altvater! My humans and I are always very happy when we meet him and his wife Margret! Sadly, she and my mom Naaja didn't accompany them this time. 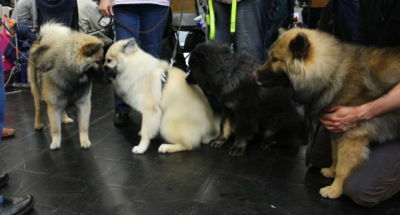 But instead, other nice family members accompanied Bora and my breeder and they knew me when I was a puppy. So I was really happy to meet them again, and my people were also happy to get to know them. We Eurasiers are just a huge family, no matter if we have two or four legs! 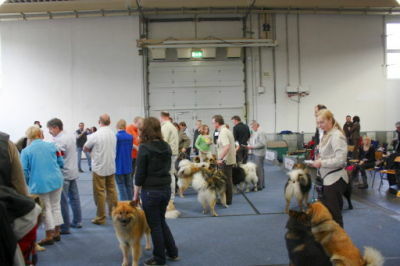 Here I am with my Alina in the ring. 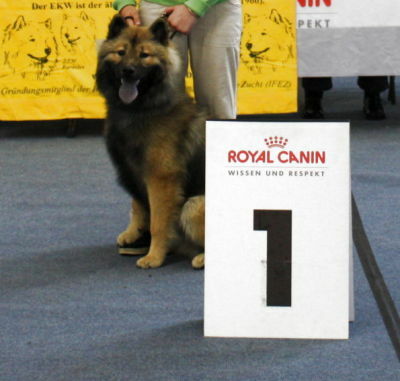 My people were a little worried if we would make it, because a few days prior to the show Alina and I had a bad experience with someone who obviously does not know my breed well. 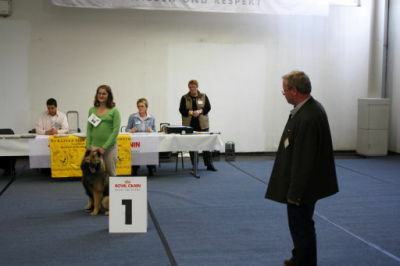 But the nice judge here in Dortmund, Mr Paul Silder, helped me and my Alina to forget about the bad experience and to enjoy being at the dog show. He greeted me really nicely, and so of course I showed myself on my best behaviour, and allowed him to pet my fur. Because, as it is written in our standard description, I am also "reluctant towards strangers", but closely bonded to my family. If strangers are unfriendly towards me, or display an outward friendliness which doesn't reach the core, then I do not want to deal with them, and I just ignore them. 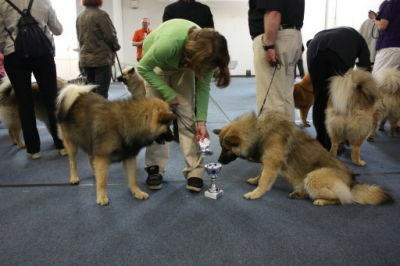 But if someone is really friendly towards me and my people, then I shower them with the whole range of the Eurasier charms. I like this nice judge. 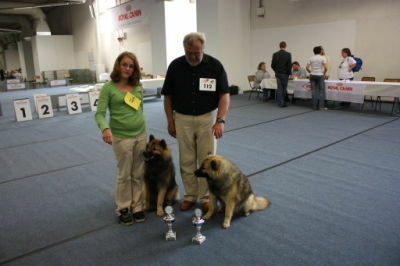 He wrote me a great evaluation and I got my first "very promising - first place". WOW, my Alina was radiating joy and everyone was happy with us. 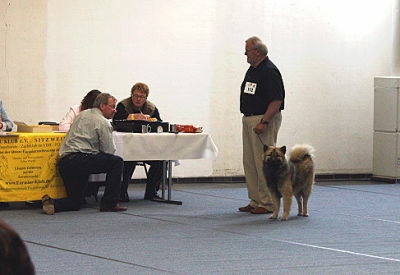 It is really a lot of fun to meet other Eurasiers, and also their owners. Well, actually our people do not own us, but we bond with our humans. 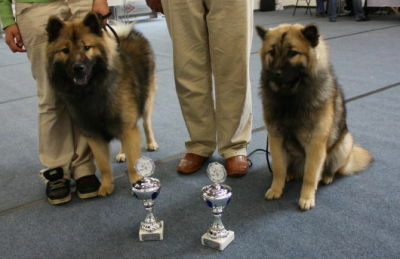 And here is Bora, then Akyra vom Roten Prinz (who is Akari's sister), then Akari and then me. Akyra is cute, too, and she looks a lot like mom Naaja. 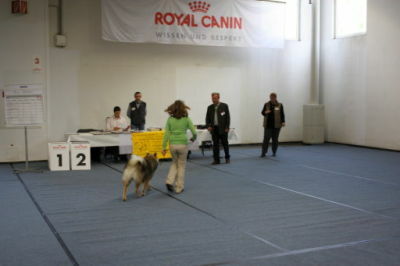 And here is my sister Bora in the ring. Can you see how nice she is doing? She is like a pro already at her young age. 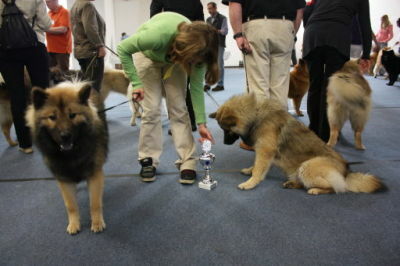 So it is not surprising that she got her second "very promising first place" in the youngsters age group. When Bora was done, my people and I went around through the exhibition halls. Wow, there was a lot going on there! Intersting smells all over the place; very exciting for a young boy like me. 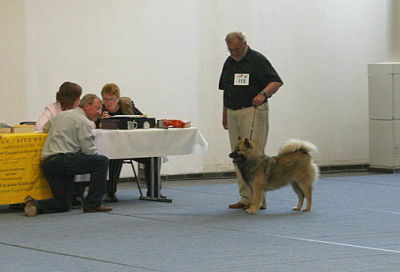 Many people thought I look great, and they spoke with my humans about me and my breed. Then my family bought some stuff for me, but I was mostly interested in the snacks. And then I finally got to sleep a little bit. Here in this picture we are all waiting for our evaluations. 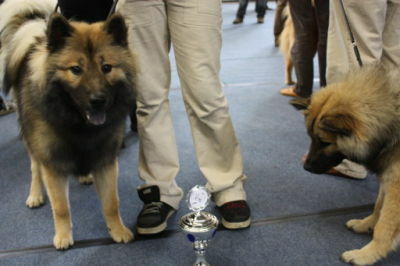 Here I got my new trophy, but I was only interested in it after Alina put some treats in it. All in all it was a very exciting day. 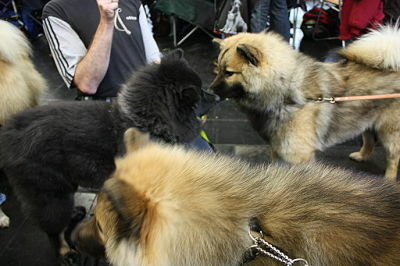 My people and I were happy to meet so many nice humans and dogs, and to see once again that the Eurasier family is a huge family - no matter to which association in the VDH one belongs to. 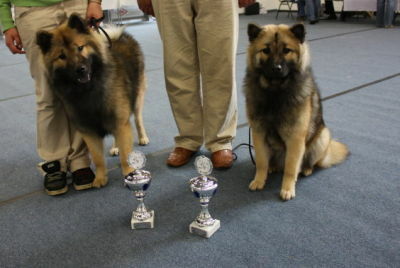 It is about us Eurasiers and that's the most important to all of them, no matter if KZG, ZG or EKW, the three German Eurasier Associations in the VDH. On the way back home I fell asleep, and reaching our home and meeting the rest of the family I let Alina speak about our success. All I was able to do was laying down, and dreaming about the exciting day.